or call us at 407-966-4401. You can do it, and you don’t have to do it alone. Our New Day, New Weigh medically assisted weight-loss program makes it easy and fun to optimize your health through a multidisciplinary approach with the help of a registered dietitian, an exercise specialist, and a behavioral health counselor. Craving sweets or carbohydrates daily. Feeling sleepy after eating, or shaky after going without food for several hours. A family history of diabetes or escalating levels of obesity in parents, siblings, or children. 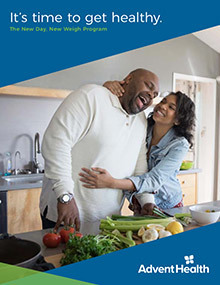 Dr. Damon Tanton, Medical Director for the AdventHealth Diabetes Institute, formerly Florida Hospital Diabetes Institute, discusses how our New Day, New Weigh Program offers weight-loss assistance while helping you avoid developing diabetes. Give us a call at 407-966-4401. Don’t wait to make this positive change for your health. Visits between your endocrinology provider and our obesity specialist team for a comprehensive hormonal evaluation. One-on-one nutrition assessment, nutrition and behavioral counseling, personalized meal plans, and individualized monthly progress testing to help you reach and maintain your weight-loss goals. One-on-one exercise visits to create a personalized approach to improving health markers and losing weight. Monthly Lifestyle Education sessions to discuss a holistic approach to weight management and glucose control. Monthly body-composition testing to help individualize your program to your body mass index, body fat percentage, muscle percentage, total body water percentage, and resting energy expenditure. Find an encouraging support team to empower you. Get educated on your diabetes diagnosis, medical treatment, and lifestyle. Develop a personalized plan that may include private consultations and hormonal evaluation, nutritional counseling, behavioral assessments, fitness consultations, and ongoing support. Lose weight and maintain a healthy weight for you. Please fill out the form below to receive your diabetes guide. We hope the guide answers any questions you have and helps you take charge of your health.